Homegrown veggies are in full swing here at Eckert’s in Belleville! Our farm crew picks the fields fresh daily and we quickly send crates of zucchini, tomatoes, kale, onions and peppers to various Eckert’s retail locations in Kentucky, St. Louis and Grafton IL. We also have a Pick-Your-Own veggie patch in Belleville. It sure is fun to see families picking boxes filled to the brim with sweet corn, tomatoes and squash. Inspired by all this picking, a tasty homegrown lunch is on my mind. I decided to try a combination of fresh picked veggies from the farm and local ham (I used Wennemann’s ham, from St. Libory, IL. This ham is sold in our deli case in the Belleville Country Store). And since I rarely have a meal without cheese, I added some herbed goat cheese as well. Why not, right? My favorite part of the wrap is the creamy goat cheese mixed with fresh cut herbs. If you are not a fan of goat cheese, try cream cheese or even plain yogurt instead. You may want to keep some extra cheese spread on hand for crostini or adding to pasta. It is so simple and such a great flavor booster. Now, on to a couple tips to help keep the veggies at their best once they are inside the wrap. First of all, I salted and drained the spiralized squash. This quick process removes some of the excess water from the squash which prevents the wrap from getting soggy. Secondly, onions and peppers take a quick jump into the oven to remove moisture and concentrate flavors. These two steps will save you from a wet wrap that easily falls apart. Wow! I have to say this wrap looks so pretty and tastes just like summer should. I hope you will give it a try this homegrown season. *Mix cheese with herbs of choice. This can be covered and refrigerated for 3 to 4 days. 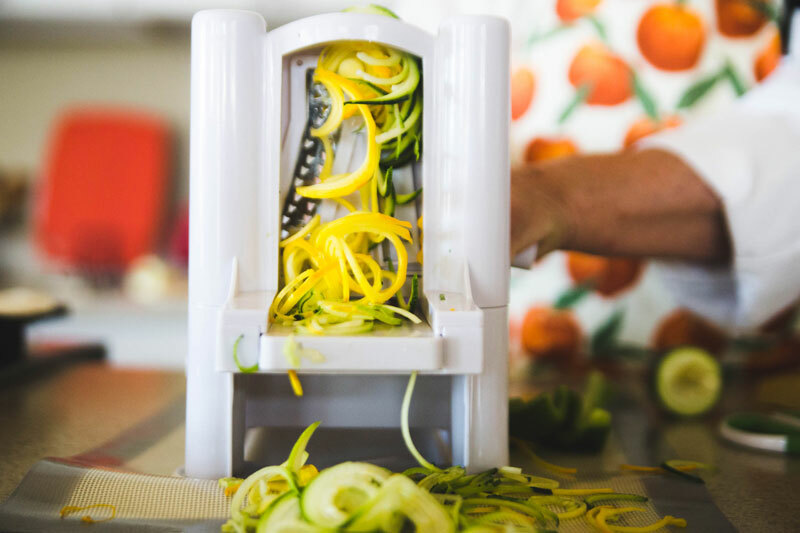 Using a hand or table top spiral vegetable slicer with the fine blade, make ribbons (spaghetti) sized vegetable noodles. Place a large colander over a large bowl. Add vegetable ribbons; lightly salt. With hands, toss salt and ribbons. Set aside about 5 to 10 minutes to remove some liquid. Discard liquid. Meanwhile, preheat oven to 425-degrees. On a parchment lined baking pan, roast prepared onion and bell pepper until slightly browned and most of the moisture is evaporated, about 6 to 8 minutes. Using tongs turn vegetables once or twice to evenly brown. Set aside to cool. To Assemble Wrap, evenly divide Cheese/Herb mixture over the flour tortillas leaving a ½” edge. Center 1 slice of ham over cheese. Evenly divide the roasted onions, peppers and grated cheese over each tortillas. Evenly divide the drained spiral vegetables on top. Roll up the filled tortillas, tucking the edges while rolling. Cut in half and serve. Option: Filled tortillas can be made 6 to 8 hours ahead of time. Tightly cover and refrigerate. Remove from refrigerator about 30 minutes before serving.